There's more than one way to invest in municipal bonds. Closed-end municipal funds seek to provide higher levels of income, and short-term volatility can present attractive entry points for long-term investors. Just do the math. At the end of September 2018, investment grade bonds represented by the Bloomberg Barclays U.S. Aggregate Bond Index were yielding 3.46%. The Bloomberg Barclays Municipal Bond Index had a lower yield at 2.86%. However, taking into account their federal tax exemption, muni bonds provided a tax-equivalent yield (TEY) of 4.83%. (TEY is the amount of yield a taxable bond would have to provide in order for the investor to achieve the same level of after-tax income as that provided by a tax-exempt bond.) In this case, munis provided 1.37% more yield on an after-tax basis versus high-quality taxable bonds. This example assumes the highest personal tax rate. 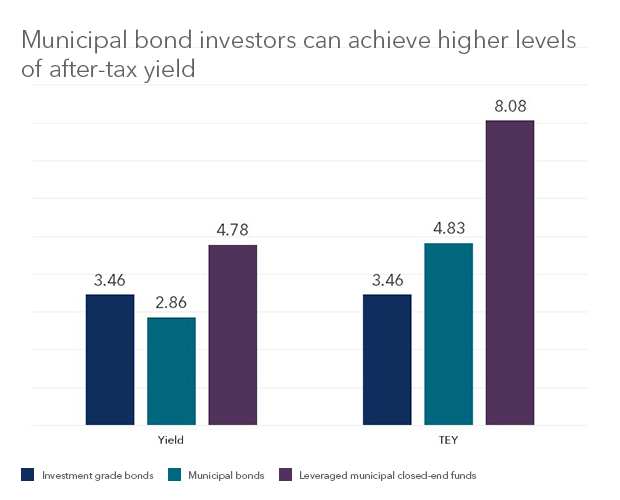 But even in today's low-yield environment, investors in any tax bracket can benefit from municipal bond tax exemptions. But there's no such thing as a free lunch. Investors who desire the higher level of income afforded by a CEF must be willing to tolerate the price volatility that comes with the territory of exchange-traded securities. Fluctuations in investor demand drive disparities between a CEF's market price and its net asset value (NAV). While CEFs broadly may trade at a premium to NAV at times, market prices are usually lower than the NAV. In our view, these conditions are cyclical, and discounts this wide are not likely to persist long-term. Historical data has shown that while muni CEF discounts fluctuate, they eventually trend back to their norm. 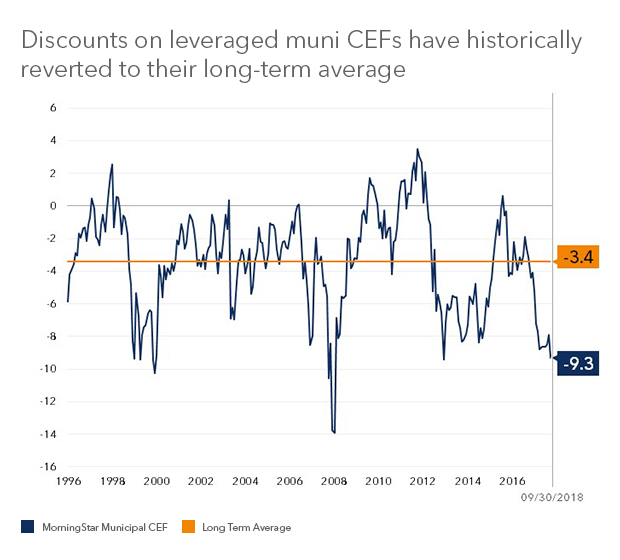 As compared to the -9.3% average discount at the end of September, average muni CEF discounts have been narrower on 97% of the trading days going back to the beginning of 1997. That said, we believe the selection of a muni CEF as a long-term holding should be driven by the investment's ability to provide attractive levels of tax-exempt income over time, whereas market price performance tends to have minimal impact on the total return of a muni CEF over time.